While flashlights form Smartphones are becoming accessible to a lot of people today, there are still people who are again buying flashlights. The reason may be because of the LED technology that most flashlights on the market have today. LED flashlights are known for their longevity, size, and their brightness. Due to these reasons, they are a perfect companion for people who are looking for something in your basements or when they are out hitting the trail. But with the many LED flashlights in the market, it is a challenge to find the best one out there. Fortunately for you, I have gathered the top 10 best-LED torches that will surely help you in the dark. The Streamlight 74751 Strion flashlight is made out of aircraft grade aluminum for durability. It is also very compact and has a rugged surface so you can grip it securely. As of today, this flashlight is one of the brightest LED flashlights today which is also known to be affordable. 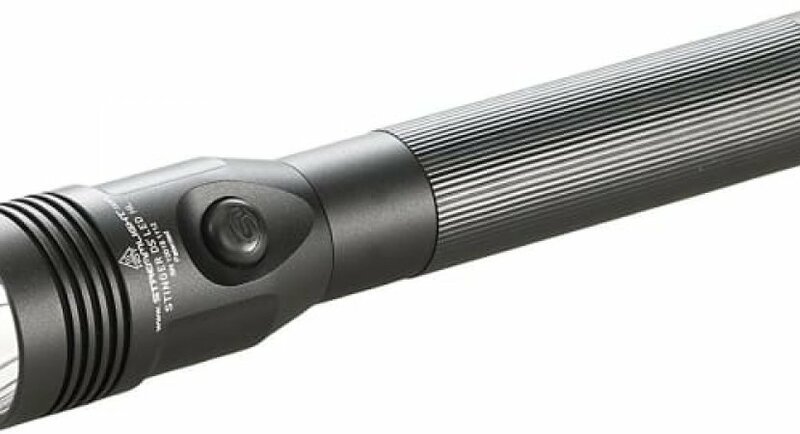 One of the best things about this flashlight is that it is equipped with an anti-roll mechanism, which means that the flashlight won’t roll once you put it down on a surface. With the IPX-4 rating that the Streamlight 74751 Strion flashlight has, you can submerge this flashlight for up to 2 meters. To avoid overcharging the flashlight, it has a digital control circuit and a charger holder. This flashlight offers a total of 50,000 hours of a lifetime and has three-lumen settings, of 125, 250, and 500. The SureFire P2X Fury Tactical flashlight is a US military grade one. It is very compact, which makes this perfect for law enforcement use, survival situations, and even for everyday use. It has a micro-textured precision reflection, which protects the LED. One of the best things that people love about this is the wide, far-reaching, and smooth beam. Another good thing about the SureFire P2X Fury Tactical Flashlight is that it is indestructible because of the high-quality materials used. This flashlight also has a maximum lumen of 600, which means that it can blind your attacker temporarily. The SureFire P2X flashlight will not only illuminate your path but will also help you during emergencies. The Fenix PD35 TAC flashlight has an impressive LED with a maximum lumens output of 1,000. 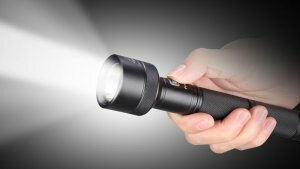 One of the best things about this flashlight is that it is less than 5 inches in length, which means that it can fit in your pocket comfortably. The beam, on the other hand, has a maximum distance of 650 feet. This flashlight has a momentarily on, free mode, and a tactical mode feature. This Fenix PD35 uses either two lithium-ion batteries or rechargeable lithium-ion battery. If you want to use your flashlight for an extended period of time, then you should use the lithium-ion batteries. The Anker LC130 flashlight has the power to produce a maximum lumen of 1300 and includes five different lighting settings. One of the best things about this flashlight is that you have the ability to control its brightness, and as well as change its width and shape depending on your preferences. This Anker LC130 flashlight is powered by a rechargeable lithium-ion battery, wherein it can operate nonstop for six hours. The battery can last for 50,000 hours, which is quite impressive. Another good thing about the Ankler LC130 is that it has a USB style cable, but an adapter should be bought if you want to charge it on a socket. Lastly, it will take roughly eight hours for you to charge the flashlight fully. The ThruNite Mini TN30 is one of the most compact flashlights today. It has the power to produce a floodlight beam and can provide a total lumen of 3660. This flashlight is using a rechargeable lithium-ion for maximum usage and utility. But take note that this kind of battery will take some time to charge. But once they are, they can last for an extended period of time. Thus they are cheaper than the disposable ones. This ThruNite Mini TN30 has an orange peel reflector to ensure that it will diffuse light uniformly. It is also equipped with a low voltage indicator and a metal switch mechanism. This means that the flashlight can operate silently and will provide you a LED output that’s consistent and steady. 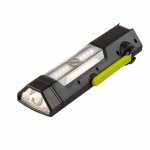 The Klarus Xt11GT flashlight is lightweight and compact, which is also known to provide the brightest light. It has a maximum lumen output of 2000 when it is set to its highest setting. This flashlight features three different operating settings, including advanced tactical, tactical, and outdoor. You have the option to choose between these three modes depending on the situation that you are in. This Klarus XT11GT includes a pocket clip, holster, car charger, 18650 rechargeable, lanyard, extra o-ring, and the USB type charging cable. You will love the flashlight because it is almost indestructible, shockproof, and waterproof. 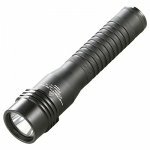 The Maglite ML300L 6-Cell flashlight is perfect for security guards, police officers, and first responders. One of the best things about this flashlight is that it can also be used as a self-defense tool. It is also made out of anodized materials and is resistant to both corrosion and water. 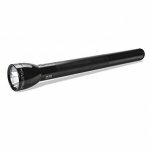 The Maglite ML300L has a maximum lumen output of 700 and has the power to last for a long period of time. The Goal Zero Torch 250 flashlight is perfect during emergency situations, like when your car starts to break down or when the lantern’s battery starts to die. This flashlight is equipped with 250 lumens and can illuminate your garage, living room, and vehicle. When the flashlight is fully charged, it can last for a minimum of 7 hours and a maximum of 48 hours depending on the brightness setting that you are using. One of the best things about Goal Zero Torch 250 is that it can be charged under the sun because it’s solar powered. Another good thing about this is that it has an emergency setting wherein the light will start shining red instead of white. Lastly, it can work as a power supply for tablets and smartphones. 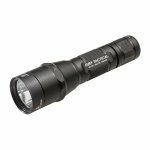 The 1100 Lumen CREE XM-L2 is perfect for underwater flashlight and other outdoor activities because of the bright beam that it produces. This flashlight has an adjustable strap so you can secure it on your wrist and use both of your hands for your activities. There are two available brightness levels and as well as a strobe light so you can photograph whatever it is under the water. 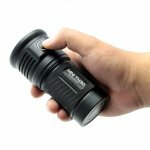 One of the best things about this flashlight is that it has an exterior that’s durable. It is also waterproof which will prevent the batteries to get damaged. Another good thing about this is that this flashlight uses a rechargeable battery and can last for 50,000 hours. The Stanley Fatmax flashlight is perfect for both outdoor and indoor projects. It has a pivoting stand, which means that you can use it hands-free and work on your desk or on your vehicle. 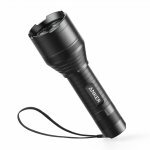 This flashlight is durable enough wherein it can withstand different activities, including fishing trips, hikes, camping trips and more. 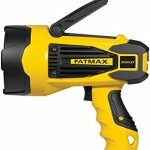 This Stanley Fatmax has the power to produce a total lumen of 920. It can illuminate an entire warehouse because of its brightness. You can either choose from the lowest setting, and the battery will last for 7 hours. If you’re going to use this on its highest setting, then it will continue for an hour. The first thing that you need to do is to know the purpose of the LED flashlight that you’re going to purchase. Some of the main reasons why people are buying are because they want something that they can use for rescue operations, while there are also some who are looking for a flashlight for hunting. If these are the case, then you would need to purchase a LED flashlight with at least 1000 lumens. But if you are going to use it for fishing, sailing, camping, or any recreational purposes, then a 300 to 1000 lumens will do. Lastly, for short-range use, the flashlight should be 100 to 300 lumens. Another essential thing that you need to do is to know the price so you’d know your budget. If you want a durable one, then it may be advisable to avoid purchasing cheaper flashlights. You can prepare a budget of $100, so you can be assured that you are getting the quality and latest technology that you need. One of the most important features when it comes to purchasing a LED flashlight is the battery. There are different batteries available, and they all have their own benefits. Most flashlights run on AAA or AA with NiMH cells. There are also ones that have Lithiums, which is a better option but pricier. As mentioned above, AAA and AA batteries are the most used types of batteries when it comes to flashlights. These batteries are available almost everywhere, and you won’t have a hard time finding them. They are also affordable so the budget won’t be a problem at all. CR123 batteries are known to be lithium batteries that are very high in performance. They provide powerful beams, and the batteries are compact. But remember that this kind of battery is expensive, so prepare a bigger budget. CR2 batteries are originally made for security devices, garage door openers, and digital cameras. But nowadays, LED flashlights are now using this type of battery. They may be small, but they are extremely bright and of course, expensive. These types of batteries are also used in LED flashlights, and they produce extremely bright lights. This may be one of the reasons why this kind of flashlight is perfect for tactical ones and can also be used for self-defense. The reason behind this is because the light can temporarily blind an attacker, which is an advantage for you. The next thing that you need to do is to know the lumens of the flashlight that you want. The higher the total lumens of the light, means that brighter its beam. For instance, if you are going to purchase a flashlight with 1,000 lumens, then this means that it will be brighter and will have a longer beam distance compared to a flashlight with 180 lumens. You also need to know the materials used when purchasing a flashlight. You need to make sure that the materials can withstand impact and water in case of emergency. There are flashlights that are known as indestructible, and they are usually used by firefighters, construction workers, and police officers. You definitely bring your keys with your , and this makes the keychain LED flashlight perfect. There is keychain LED flashlight which you can attach to your keys or vice versa. They are diminutive in size, and they usually use triple-A batteries or smaller ones. Penlights are LED flashlights that have the shape and size of a pen. You have the ability to put in in your external pocket, breast pocket, jacket, and in your bag. Penlights are usually longer than the keychain LED flashlights and they are powered by two triple-A batteries. This will give you more runtime and power. Trunk lights are big LED flashlights that can provide you with more than enough power. They are large enough to be used as a self-defense tool. This kind of flashlight can blind an attacker because of its bright light. Headlamps are available in different bulb colors and use different battery packs. This is perfect for people who are hunting and ones who are working on their cars and other stuff. The reason behind this is because you don’t have to hold the headlamp since it has a headband that can be placed on your forehead. One of the benefits of using LED is that compared to the traditional lighting, LEDs have a longer lifespan. The average lifespan of LED is 50,000 but can also go up to 100,000 hours. This means that the lifespan is four times longer than sodium vapor lights, metal halide, and fluorescent. This also means you don’t have to replace it too often, which makes this an efficient flashlight. Another good thing about using LED is that it only consumes low power, which makes it very energy efficient. You can check the energy efficiency of flashlights by checking the useful lumens and the luminous efficacy. Using LED will help improve the total energy efficiency by 60 to 75%. The savings can be higher depending on the usage. Another benefit of using LED is that they are safer especially when it comes to light being emitted. The reason behind this is because there is no heat being emitted compared to the traditional bulbs. Traditional bulbs are converting almost 90% of total energy so that they can be converted to heat. So this means that since LEDs are consuming less power, they can work effectively on a low voltage system. If something goes wrong, you won’t have any problems at all because LEDs are safer. Color rendering index is a measurement of the light’s ability to actually reveal the real color of the best compared to natural light. LEDs are equipped with CRI, but all LED flashlights have different levels of CRI, depending on the application. Another good thing about LEDs is that they are small, which means that no matter how small your flashlight if it’s equipped with LED, it will surely produce a bright light. One of the best things about small flashlights is that they are perfect for several lighting applications. 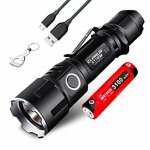 This also makes the flashlight versatile, which is a good thing since this means that you no longer have to purchase a separate flashlight just to use it for other things. LED has the power to emit light for up to 180 degrees, but there are other lights that have the ability to emit 360 degrees. 360 degrees of emission means that it can necessitate the flashlight to reflect or redirect the light. This can add up to the cost, which makes the flashlight less efficient. But since LED only emit 180 degrees of light, it can save the overall’s efficiency, which is definitely a benefit. As mentioned above, LEDs are small which makes them flexible and can be used to almost everything. You can either use it as it is or use it together with the other flashlights. This simply means that you can do almost anything with LED flashlights. Another benefit would be the power of LED to dim accurately. If you are going to use the dimming capabilities of LED this can help reduce the power that is being emitted. Traditional bulbs don’t have the power to dim its light since the hardware is needed for this. Also, with this kind of capabilities, the flashlight’s lifespan will increase as well. Another good thing about using LED flashlights is that LEDs do not have any environmental issues, unlike with fluorescent or other bulbs because of the mercury content that they have. This is why different types of bulbs need to be handled carefully. With LED, you don’t have to worry about this kind of problem. LED’s energy is being emitted in the spectrum’s that’s visible, in a small amount of the infrared spectrum. This means that there is no UV portion that is being emitted, which makes LEDs reliable and safe. The UV that comes out of LED will be decreased and broken down if it gets exposed to this kind of emission. LEDs are operating on low voltage, which makes them perfect for outdoor use. If you live near the oceanfront or if the weather gets too cold and such, then LEDs are perfect for you. 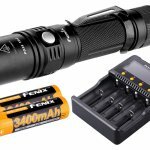 With all that being said, with the top 10 best LED flashlights, they have surely helped narrow down your options when it comes to the available LED flashlights on the market today. Follow the tips on how you can choose the best one so you can make the most out of your purchase.